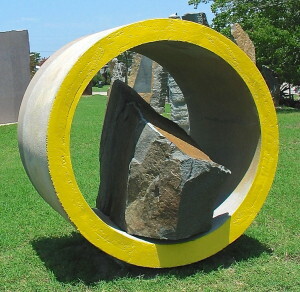 It is made of granite, concrete, and paint and measures 58” X 58” X 61”. Local artist Wells Mason helped him set the sculpture yesterday. I saw Jim working on it and wondered what he was planning for that concrete ring. It’s a unique addition to a unique sculpture garden. The Huntington Sculpture Foundation is open every day and all sculptures are available for purchase. You don’t have to buy anything but if you enjoy this special place, drop a few bucks in the box and sign the guest book. Mornings and early evenings are the best times to visit this time of year but if you don’t mind the heat, it looks especially nice in the middle of the day with the sun overhead and the green grass as a backdrop. This entry was posted in WHAT is That? and tagged Huntington Sculpture Foundation, Jim Huntington on August 2, 2013 by Stewart Dale Spencer.